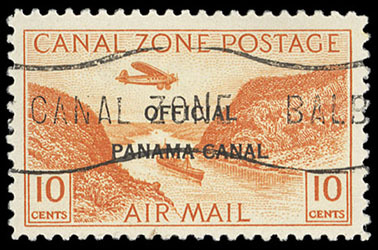 Canal Zone, 1918-19 Ocean to Ocean Aero & Submarine Mail Service, two legal size O.B. covers; 1918 Fourth Liberty Loan Flight and 1919 Victory Loan Submarine Mail Service - both Cristobal to Balboa, each with special cachet date stamp and signed by loan chairman and director of posts C.H. Calhoun, Very Fine. Canal Zone, Airmail Officials, 1941, 5¢-40¢ complete, type II, usual Balboa Heights roller cancels, rich colors, a Very Fine set. 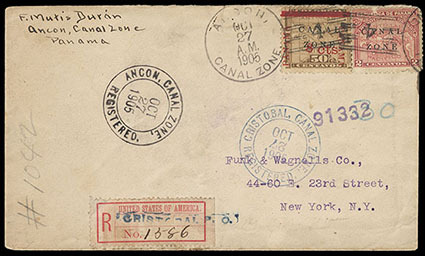 Canal Zone, Cristobal P.O., utility label with blue handstamped name and manuscript, "1586" number on 1905 registered cover from Ancon, Canal Zone to New York N.Y. bearing 2c rose (10), faults, and 8c on 50c bister brown (14) tied by "Ancon, Canal Zone, Oct 27" duplex, additional Ancon Registered (10.27) and blue Cristobal (10.27) transit, reverse with magenta New York (11.5, 11.6) backstamps, Fine, Census No. CZ-69. Scott No. FX-CZ2 Estimate $500 - 750. 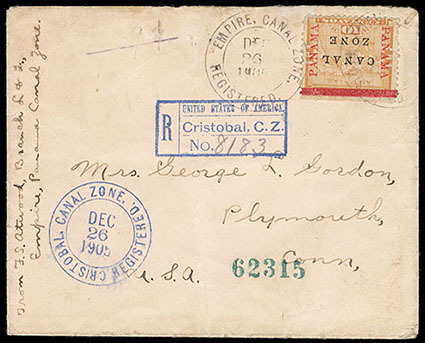 Canal Zone, Cristobal, C.Z., blue simulated registry label handstamp on 1905 registered cover from Empire, Canal Zone to Plymouth Conn. bearing 10c yellow (13), top s.e., tied by two strikes of "Empire, Canal Zone, Dec 26 1905" cds blue Cristobal (12.26) cds, New York (1.4) backstamp; some flaws, F.-V.F. Scott No. FX-CZ var. Estimate $250 - 350. 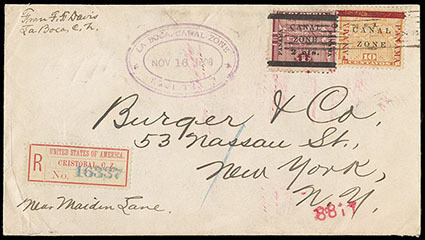 Canal Zone, Cristobal, C.Z., registry label with "16337" number on 1906 registered cover from La Boca, Canal Zone to New York N.Y. bearing 10c yellow (13) and 2c on 1p (17b) tied by "Canal Zone" bar cancel, purple "La Boca, Canal Zone, Registered, Nov 16 1906" oval postmark; reverse with purple Cristobal (11.17) cds and magenta New York (11.24) arrival datestamp, Very Fine, Census No. CZ-67. Scott No. FX-CZ1 Estimate $400 - 600. 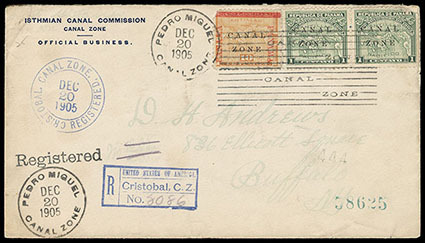 Canal Zone, Cristobal, C.Z., blue simulated registry label handstamp on 1905 registered Isthmian Canal Commission cover from Pedro Miguel, Canal Zone to Buffalo N.Y. bearing 1c green, pair (9) and 10c yellow (13) tied by "Pedro Miguel, Canal Zone, Dec 20 1905" cds and bars cancel, blue Cristobal (12.20) cds, New York (1.1) and Buffalo (1.2) backstamps; stamp flaws, F.-V.F. Scott No. FX-CZ var. Estimate $300 - 400. The simulated registry handstamps were introduced at Cristobal in 1905 and were in use for only a short time period. 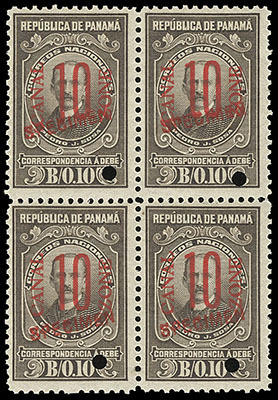 Canal Zone, Postage Due, 1915, 10c on 10c olive brown, red "Specimen" type B overprint, security punch hole, block of 4 (positions 43-44, 53-54), o.g., never hinged, bright and fresh, F.-V.F., only 300 sold. Scott No. J9S Bc Estimate $150 - 200. 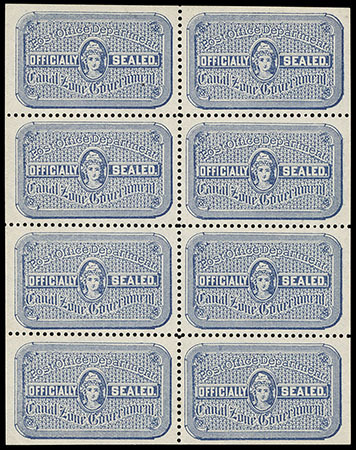 Canal Zone, Post Office Seal, 1907, blue, complete pane of 8, without gum as issued, fresh with strong bright color, Very Fine and choice. 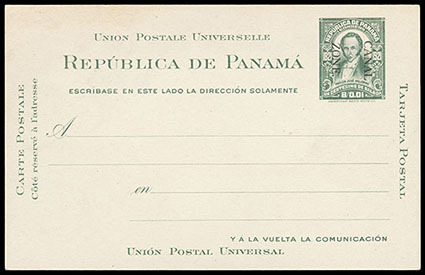 Canal Zone, Postal Card, 1921, 1c green, entire, bright and fresh, Extremely Fine, in far better condition than most mint examples. 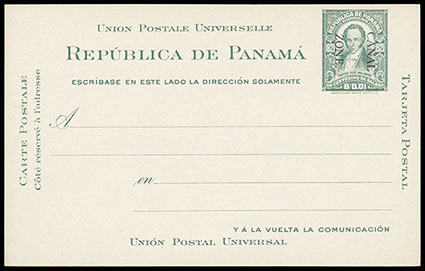 Canal Zone, Postal Card, 1921, 1c green, entire, bright and fresh, light edge toning on reverse, otherwise Very Fine.